We steeped this tea for 3 minutes and it was quite delicious. Again this Spring we are excited to receive the 2019 edition of one of early Spring’s huge hits: our Yunnan Hand-Rolled Green Curls. We are thrilled to have this tea again, and know that those of you who have been marking the days on your calendar for the arrival of early spring tea will be excited to hear the news of its return. Our Yunnan Hand-Rolled Green Curls is a bud and leaf tea, plucked in early March when the weather warms quickly in Yunnan Province. Because these leaf materials were picked and manufactured when they were so young, the tea is a lovely greenish-white color. In the cup this tea is fresh and delicious – light, airy, and rich – a lovely combination of flavor and aroma that satisfies and soothes at the same time. The tea has a unique core flavor – soft, chestnut-y, with a little Asian pear -that is a result of the special nature of the indigenous tea bushes that grow in this region. While this tea has some early spring sweetness in the dry leaf and in the cup, it is more earthy in style and less ‘showy’ than eastern China spring green teas. 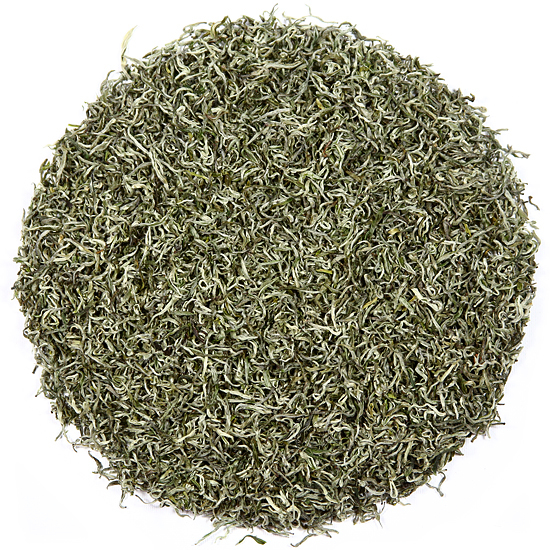 The flavor of this tea is nuanced, sweet and subtle – a hallmark of Yunnan green teas. So, this tea is perfect for those who do not want a lingering aftertaste, but rather enjoy fleeting moments of flavor that are revealed with each sip. The green curls are smooth and full-bodied without a hint of astringency. This tea was made from sturdy leaf, and should steep successfully several times. After the 1st steeping, take a peek inside your gaiwan or teapot to admire the appearance of the re-hydrated curls. They will have returned to the natural appearance they had as just-plucked fresh bud leaf: thin and perfectly shaped. This tea is a wonderful example of the tea artist’s craft and the care given to premium, artisan tea during leaf manufacture. The liquor has changed during the year and is now a clear straw color rimmed with silver.